Chocolate is incredible. We all know it tastes great but chocolate has antioxidants and minerals and can be used in so many ways. In addition to desserts, you can flavor savory dishes with chocolate, use it as a garnish, or eat is alone as a staple snack. As incredible as chocolate is, To’ak has taken chocolate to an entirely new level. To’ak chocolate is food artistry. The art of making chocolate is just that, an art. 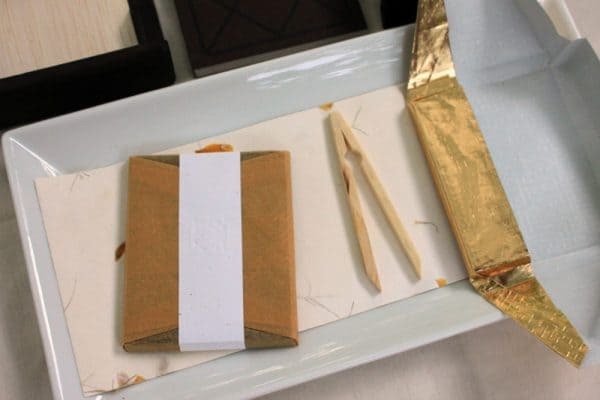 Because chocolate is available everywhere, we don’t often think about what goes into making it. Mass-produced chocolate is uniform but it lacks the personality and rich flavors of hand crafted chocolates like To’ak. Most chocolate bars available in grocery stores are made from cocoa beans from all over the world that are mixed together. 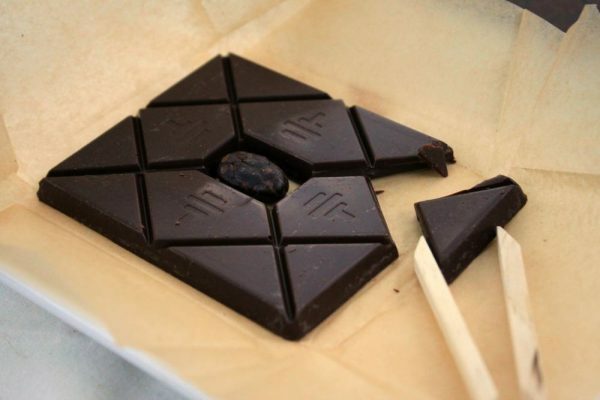 Did you know that chocolate tastes different depending on which part of the world is comes from? When chocolates from different regions are mixed together, you can’t taste the unique flavors from each region. 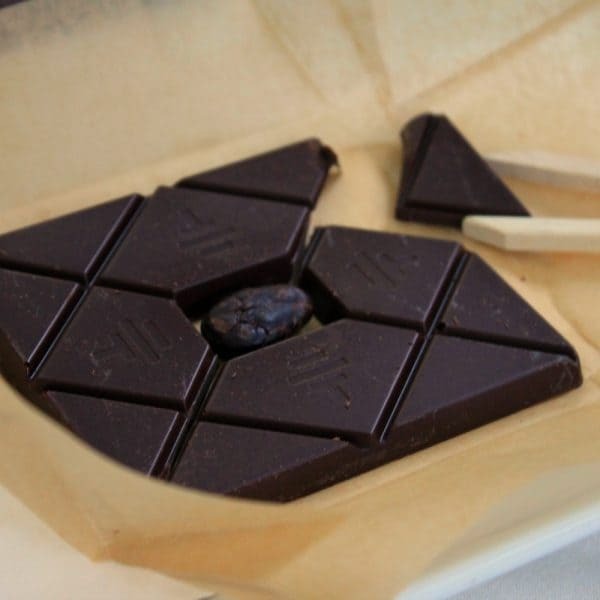 To’ak chocolate gets this amazing aroma and flavor from using a highly selective process for cocoa beans. Only 14 growers in the valley of Piedra de Plata, Ecuador contribute to To’ak chocolate, and on those farms they run DNA testing on their cocoa pods in order to assure they are are from the Nacional cacao tree. The Nacional cacao tree is native to Ecuador and is special in that is was almost eradicated from a fungus outbreak, known as Witch’s Broom. Some of the trees remained unharmed in the valley of Piedra de Plata where their harvest is used to create a pure, unified chocolate-a feat not common in today’s world. 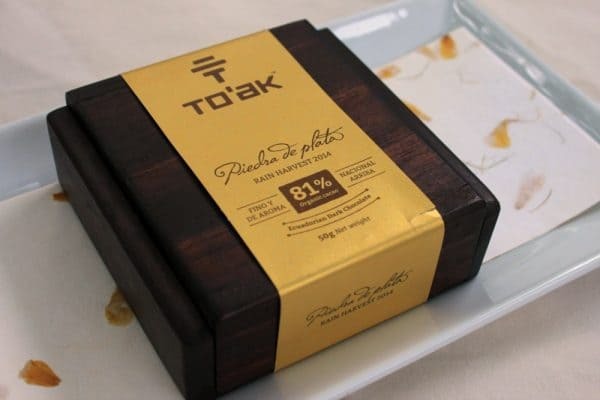 While the history and selectivity of the Nacional cacao tree plays a huge role in the chocolate’s flavor, the in depth and hands on process of making To’ak chocolate contributes exponentially to the experience. After being harvested, the cocoa beans that were used for the Rain Harvest 2014 series were fermented in Spanish Elm (the same wood used to make the boxes that house the individual completed chocolate bars) for 6 days and then roasted and ground to be mixed into the bars. During this process, the beans have to pass at least 6 phases of hand selection to assure that only the highest quality cocoa is being used to make the chocolate. Because of the selectivity and purity of the cocoa plant used, harvests are limited leading to a set number of bars produced each year. The uniqueness of the bar you purchase is shown in its presentation. 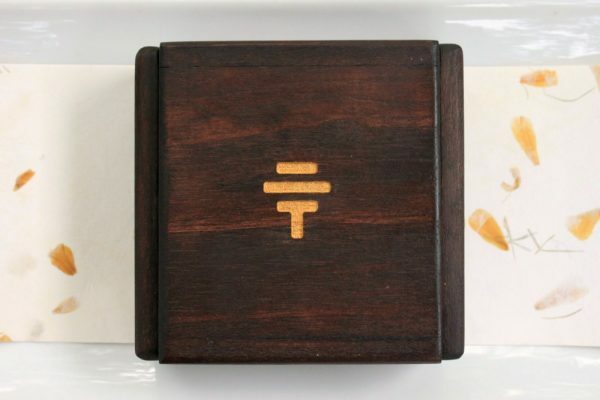 The bar is presented in a handcrafted Spanish Elm wood box with the bar’s number engraved on the back. My personal To’ak chocolate bar is the 258th bar from the Rain Harvest 2014 collection where a total of only 574 bars were crafted. To’ak believes that chocolate should occupy center stage without any distractions so their chocolate contains only two ingredients: cocoa and cane sugar. The minimal processing brings out of the flavor of the chocolate in a way I’ve never experienced before (and I’ve had a LOT of chocolate). It’s truly amazing! Don’t know how to properly experience chocolate, or just need some tips? To’ak has you covered. 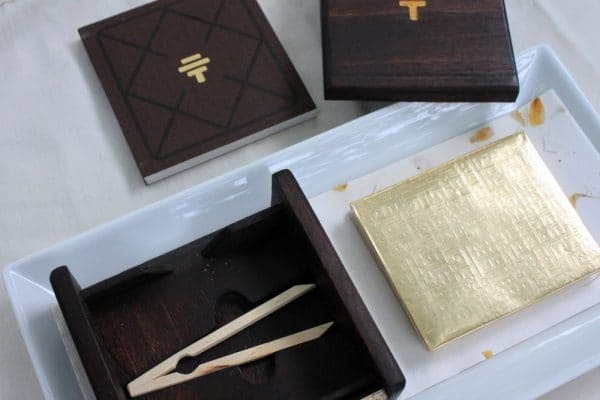 Within the box along with the chocolate bar is a pair of eating utensils (that are almost like small wooden tongs) and a 116-page booklet that explains in depth the history, creation, and proper ways to taste your individual chocolate bar. It even has a list of suggested beverage pairings. Since we have amazing local wines here in Central Texas, I did a wine and chocolate pairing session. Dark chocolate goes very well with red wines and ports so we tried 2012 Reserve Malbec from Becker Vineyards, Llano Estacado Winery Vintage Cellar select Port, and a 2011 Texas Hills Port Rubino. The Llano Estacado Port was the sweetest of the selections and the sweetness really complemented the chocolate well. The Texas Hills Port has chocolate notes in it already so those also go very well with the To’ak chocolate. The Malbec was also nice but not quite as nice a pairing as the ports. If you want to experience chocolate in an entirely new way or give an amazing gift to a chocoholic, To’ak chocolate is the perfect choice. It’s also perfect for a special anniversary or engagement. The beautiful box will serve as a reminder of that special moment for years to come. You can learn more about To’ak chocolate by visiting their Facebook page or website. 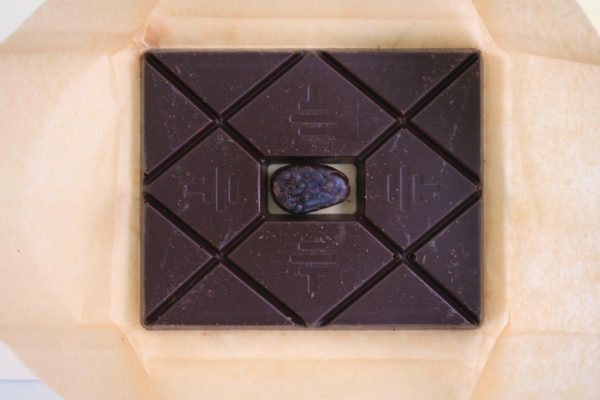 I was interested in trying this chocolate until I saw that one bar was $315.00. That’s way too expensive for what I can afford! They have slightly less expensive bars but they are very high end. I think this would be a once in a lifetime purchase for many people.